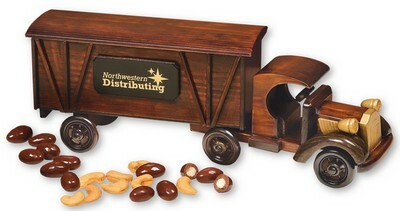 Whether you're looking for a small thank you gift or holiday office presents, a 1920 Tractor-Trailer Truck with Chocolate Almonds & Extra Fancy Jumbo Cashews is the ultimate sweet reward. Dimensions: 13 1/4" x 3 1/4" x 4 5/8"
Everyone will want to add this 1920 tractor-trailer to their collection. The tractor-trailer (13.25" x 3.25" x 4.625") includes your logo or imprint foil-stamped in gold on both sides. We include chocolate covered almonds, six-ounces, and freshly roasted extra fancy jumbo cashews, five-ounces. Every recipient of this wooden classic truck will appreciate its craftsmanship and style. Because each truck is made by hand, no two will be identical. Imported.